The singer formerly known as Sinéad O’Connor, and later on named Magda Davitt, has announced her recent name change to Shuhada’ Davitt. When you’re a public figure, announcing such a name change should be accompanied by the securing of the matching dot .com domain name. In this case, Shuhada’ Davitt didn’t proactively register ShuhadaDavitt.com and it was snagged by an enterprising domainer. This is an obvious cybersquatting case, as the name represents a famous, living individual and the domain has already been listed for sale at Undeveloped.com. In June 2015, Bruce Jenner announced a new, female identity – Caitlyn Jenner – failing to secure her dot .com domain; investor Jamie Zoch of DotWeekly.com registered the domain and gave it to the celebrity’s agent. 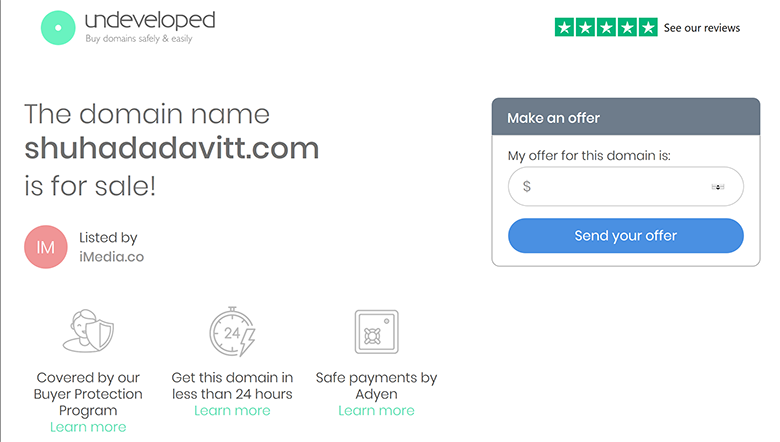 In the case of Shuhada’ Davitt, the domain is now offered for sale – how much of a contrast is that!